In order to send out the baby shower invitations in time, it’s best if you start finalizing your guest list about 6-8 weeks before the baby shower. You might want the mother-to-be to take a second look at the guest-list to make sure no one is forgotten. About four or five weeks before the baby shower you’ll want to send out the invitations. If you have out-of-town guests, you might want to send them the invitations five or six weeks beforehand to allow them enough time to make their traveling and gift plans. It’s always best if your baby shower invitations match your theme. If you’ve got the time, you can create your own (at the bottom of this page we’ve provided a few free templates for you to use). There’s always something special about receiving hand-made invitations – something that tells you that it’s going to be a special baby shower. You might also want to add something unique that has to do with the theme of the baby shower. For instance, you may want the guests to come dressed in something that has to do with the theme, or maybe you’ll ask them to bring a special object or something they’ve written that’ll be used during the games part of the shower. If the mother-to-be is registered at a gift registry add this information to the invitation (for example “Jessica is registered at Target, Babies-R-US, and Babystyle”). Including shower registry information can be very helpful, especially if some guests aren’t very close to the parents-to-be and don’t really know what gift to bring or if someone lives far away. It’s also important to state on the baby shower invitations if it is an adults-only baby shower (when you don’t want any kids coming), if kids are welcome, if it’s a co-ed party (it has become a trend lately to invite the men as well), etc. It is important to write this type of information! 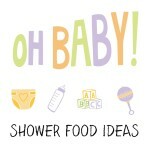 “Diaper’s and Bibs, bottles and more, that’s what Baby Showers are for! Come celebrate with us in honor of (expectant mother’s name)”. “Sugar and Spice and everything nice… is what (expectant mother’s name) girl will be made of! Join us as we shower (expectant mother’s name)”. “Let’s Shower her with LOVE! You are invited to a baby shower for (expectant mother’s name)”. 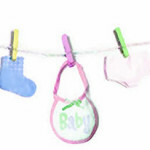 “(expectant mother’s name) baby is on the way… let’s get her prepared for the big day!”. “A baby girl is coming, and will soon be here… Let’s shower the parents with love and cheer!”. 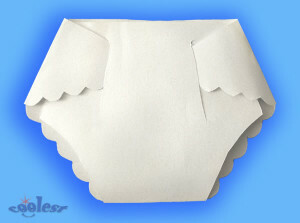 You can print out the wording on colored cardstock and you cut out each invitation into different baby-themed shapes. You can also cut out little baby feet shapes, the shape of a baby onesie, a baby rattle, a baby bottle, the shape of a stork, a baby bassinet, a baby bib, teddy bear shape, moon and star shapes, etc. You can also photograph the parents-to-be and print out their photograph and place it on the front of the invitation. Or, you can just photograph the pregnant mother-to-be wearing a shirt that has to do with the baby shower theme or even just photograph her lovely belly. Heck, if she’s up to it, you can write the baby shower info on her belly and photograph it! Think Out of the Box with 3D Invitations! You don’t have to limit yourself to two-dimensional invitations – try thinking out of the box! You can take little 3-D baby items like baby rattles, safety pins, pacifiers, little teddy bears, little rubber duckies, a box of animal crackers, etc., and just tie a rolled-up invitation to each of the items. (You’ll find many of these items at the dollar store or in bulk). Of course, they’ll have to be hand-delivered. You can write all the baby shower info with a permanent or clothe marker on little baby bibs, onesies, a diaper, any type of baby clothing. A really unique idea (it’s best for a small guest list) is to take real or toy baby bottles, print out your invitation on paper, roll up the paper invitations, put a colored bow around the rolled up invitation and put it in the bottle. You can also glue a piece of magnet to one of the sides of the baby bottle so that the guest can put it on their refrigerator. It’s also nice if you put baby-themed confetti in the bottle as well. You can place your invitations folded small into little baby food jars, also with baby confetti. You can print out the baby shower invitations info on stickers and stick them onto the jars! You can write all the baby shower information on a balloon. First you need to blow the balloon up. Then with a permanent marker, write all the baby shower information on the balloon (let the ink dry well). Then deflate the balloon. Put the balloon in an envelope and mail to each guest. Then the guest will need to blow the balloon up to see the baby shower information! You can print out the ones already filled with text, or print out the blank ones and add your own text. An idea is to print them on colored paper, for example print the rubber ducky on yellow paper, and color in the mouth with an orange marker. Enjoy!